So I began to develop some pain in my right wrist which was later diagnosed as tendinitis. At the same time I had been looking at the CT scan of my abdomen and noticed they also captured my right hand as it was resting on my stomach during the scan (I had injured my right shoulder again). I recalled a concept project a while back I had seen: the CORTEX brace. 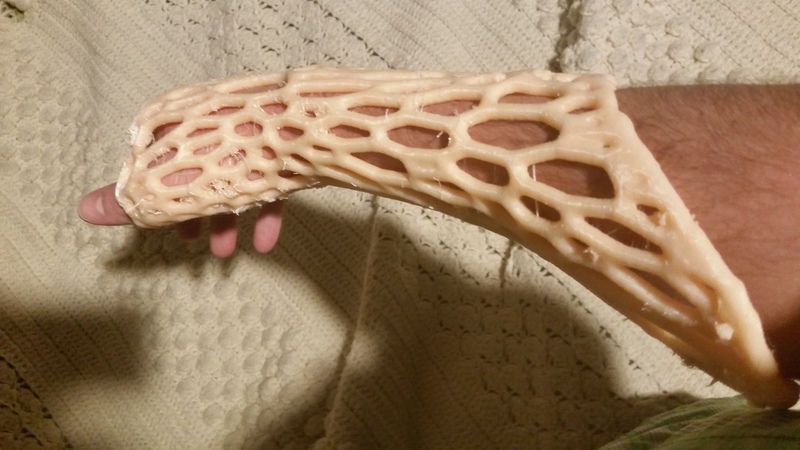 It presented the idea of replacing the typical plaster cast with a 3D printed one which would prevent the issues of sweating and itchiness… as well as be much more stylish (though not allowing people to sign your cast). 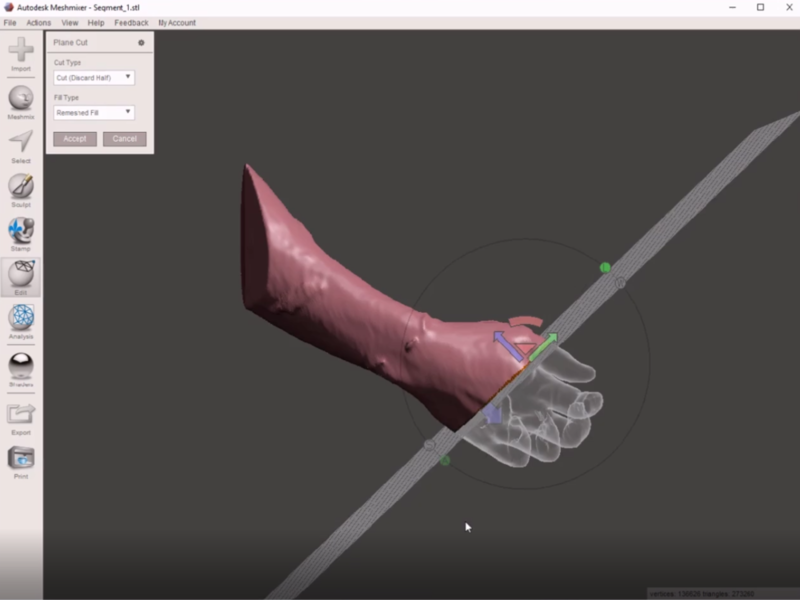 I had wanted to apply this to prosthesis sockets initially but never got past the idea stage. Looking around for how to create the ‘webbing’ style I found that meshmixer had the necessary capabilities. So I now had all the tools needed to make my own brace to partially immobilize my wrist. 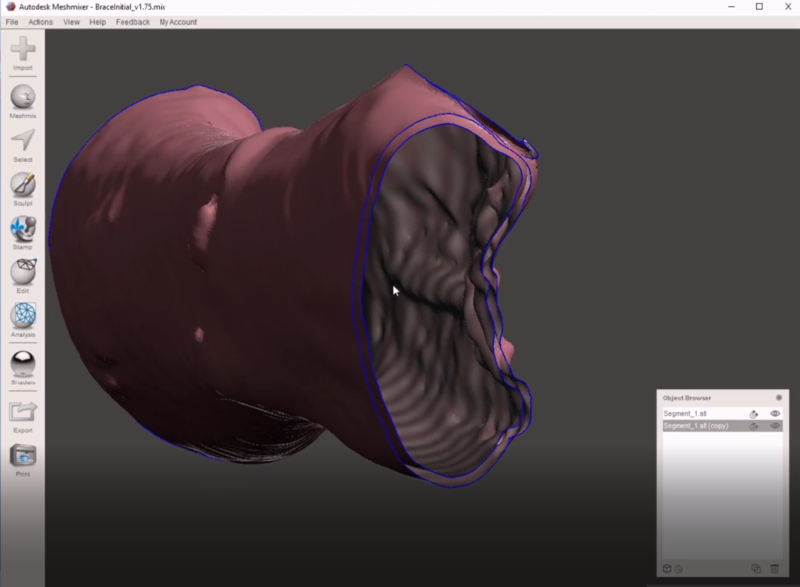 Once the surface model is created and loaded into meshmixer the first step is to cut off anatomy that you don't want in the model using 'plane cut'. Once the general shape of the brace is created the next step is to consider how the brace will be taken on and off. For my design I wanted to have one piece that is flexible enough to slide my wrist in. 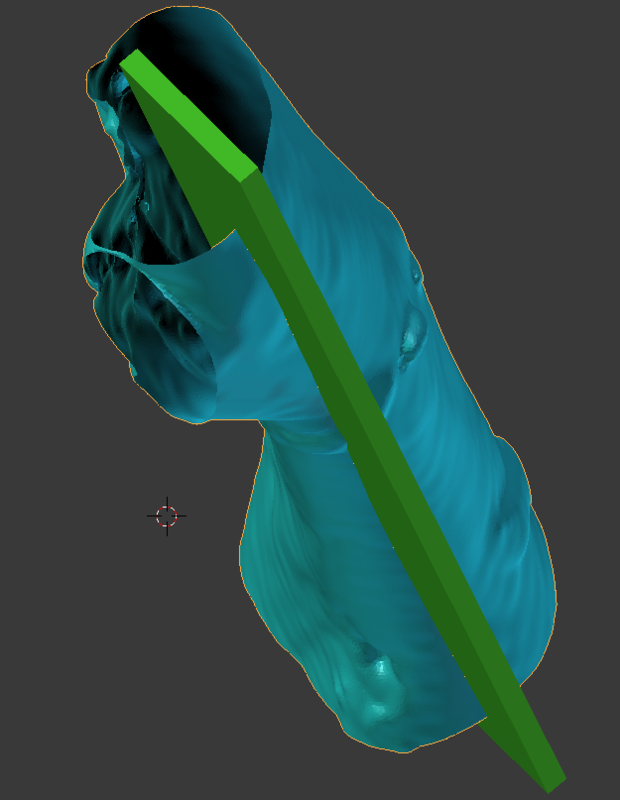 To create the 'slot' I found that I did a boolean in blender as meshmixer would crash when I tried to create the slot. With the brace model and slot in place the next step was to offset the surface since creating the voroni mesh would generate the tubes on both sides of the surface. This is done back in meshmixer and is fairly computationally intensive so partially reducing the mesh density first is a good idea. 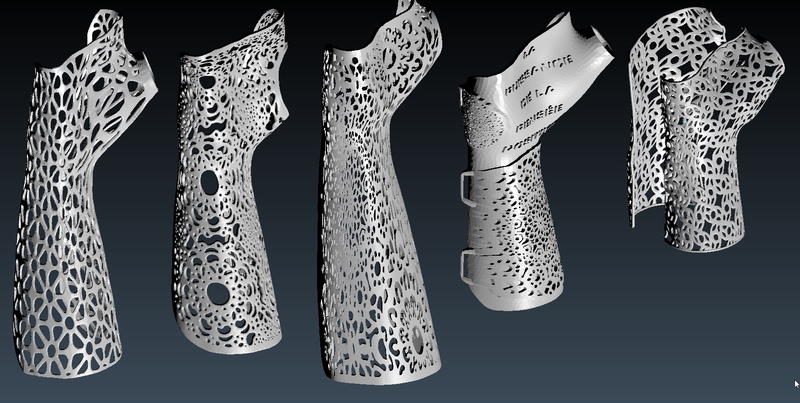 The next step is to further decimate the mesh to get the desired voroni mesh pattern. This takes a bit of playing around to get the desired style. Too dense and the resulting web structure will not have many openings which will be stronger but not as breathable. Too rough and the model may not conform to the surface well causing pressure points. 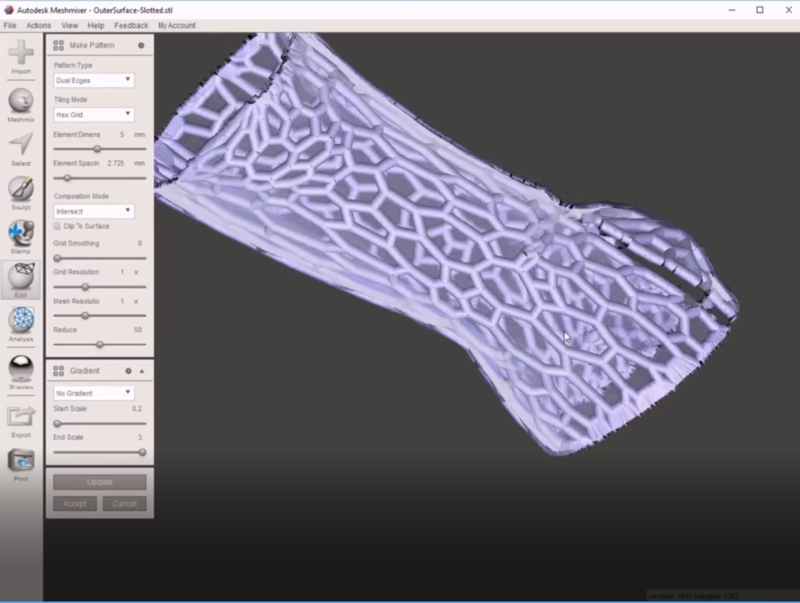 The final step is to take the reduced mesh and web like structure using the 'make pattern' feature within meshmixer. There are various settings to be applied within this feature but setting 'Dual Edges' then adjusting the pipe size to double your offset will result in the inner edge of the webbing to just touch the skin of the initial model. Having never made a brace/cast before it took me a few iterations to get a design which I could easily don and doff (put on and take off). I also found that I could make a brace that held my wrist very rigidly but would be too restrictive. Also material selection became important. Initially I used ABS which is more flexible than PLA and I had it in a nice pink skin color. It turned out to be too rigid for the style I was designing. I found PETT (taulman t-glass) to work well as it had a lower modulus of elasticity meaning it was more flexible than ABS. After using the brace on and off for a few weeks I have found that it fits well and is surprisingly comfortable. I have taken a shower with it on as well as slept with it on. It doesn’t seem to smell as bad as the cheap and common cloth type braces. The main downsides have been taking it on and off is a bit challenging still and it is more restrictive of my motion as it behaves somewhere between a brace and a cast. There is definitely a great deal of potential for this type of cast though widespread adoption would require further technical development to simplify the process. At my rate for the 3D printing part it would cost under $100 and take less than a day to print (calculated around 13 hours). This Cast looks great although the first one looks a little uncomfortable, just wondering if this 3d printed brace is actually helping with your health condition too as much as traditional cast would do? Well for my particular case its hard to say as I don't wear it 24/7. I swap between it and the cloth type. 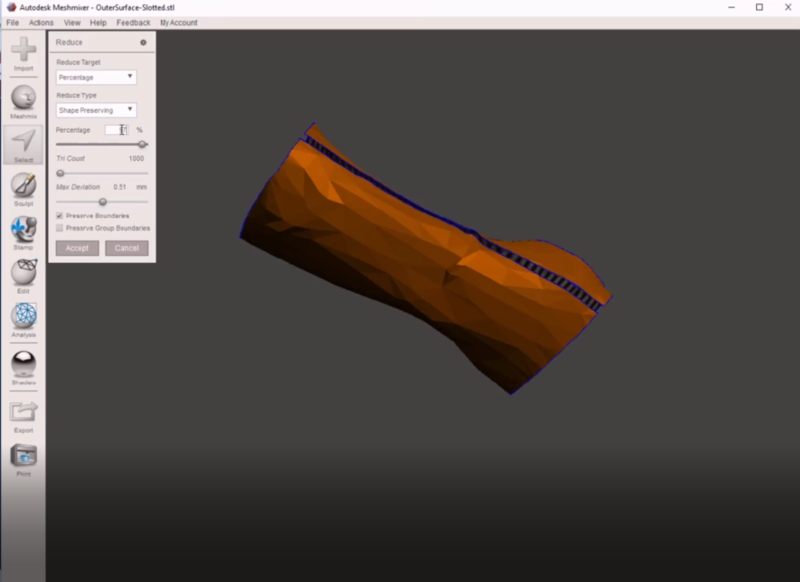 With tendonitis the printed brace is rigid and restrictive. Important for a broken bone but not so much for a soft tissue injury where it is important to have just limited mobility. I may tweak the design some more to give a bit more comfort and flexibility. Yes the early designs were far from usable/comfortable took some trial and error to get it right.